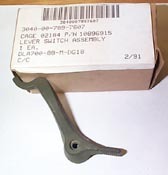 Ignition Switch Lever, 2 1/2T - 5T - Etc.. Brand New!! Ignition Switch Lever. NSN: 3040-00-789-7607, P/N: 10896915.